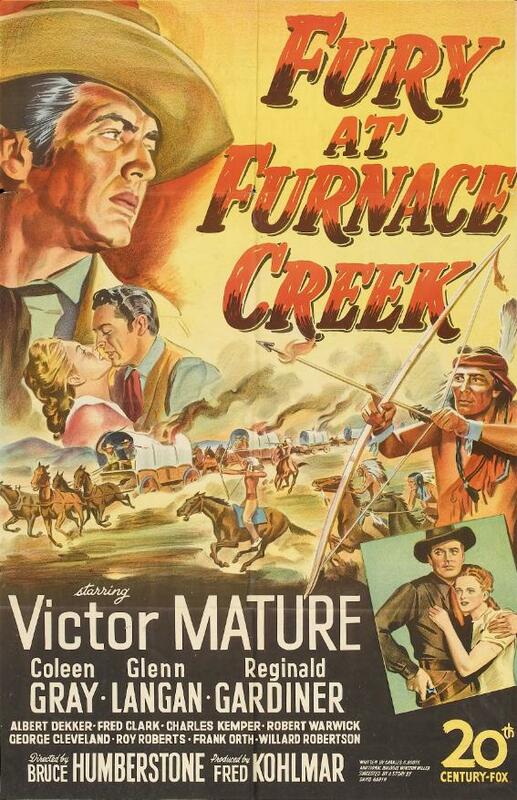 Fury at Furnace Creek might not be a towering classic of western cinema, but I think I flat-out enjoyed it more than any other western I’ve seen recently. I’ve never been a big fan of Victor Mature, but when he had good material to work with — My Darling Clementine (1946) and Kiss of Death (1947), for instance — he could be an engaging performer. I thought it made a lot of sense for him to play Doc Holliday in My Darling Clementine as a drunk and a gambler, since Mature always looked more at home in a saloon than he did riding the range. Fury at Furnace Creek allows Mature to stick with this formula, more or less. He plays Cash Blackwell, a fast-on-the-draw gambler who goes undercover to clear his father’s name. His father, General Fletcher Blackwell (Robert Warwick), died of a stroke during court martial proceedings against him, and not because things we’re going well at his trial. In 1880, the Furnace Hills were still Apache territory, but rumors that the Apaches were using silver in their bullets led to a clamor for the region to be opened to mining. Gen. Blackwell stood accused of issuing an order that left a wagon train unprotected, and the prosecutor implied that this was done purposefully to draw the Apaches into an attack, which directly led to the opening of the area to white settlement. The evidence is there, too. There is an order, signed by Gen. Blackwell, that supports the prosecution’s case. But even faced with this evidence, Gen. Blackwell still denied ever issuing the order, and he died with the shame of guilt hanging over him. Enter Cash Blackwell, estranged from his family, but not estranged enough that he doesn’t care about his father’s good name. He goes undercover in Furnace Creek, now a boom town of 10,000 settlers, miners, and merchants. Calling himself “Tex Cameron,” Cash ingratiates himself to the local syndicate by saving the life of Capt. Grover A. Walsh (Reginald Gardiner) at the gambling tables. A gunman named Bird (Fred Clark) planted a card on Capt. Walsh so he could accuse him of cheating and shoot him dead, but Cash sees through the ploy, and puts a bullet in Bird’s gun hand. “When a man can knock the knuckles off a moving hand at ten paces, I want him on Mr. Leverett’s side,” says Al Shanks (Roy Roberts). Edward Leverett (Al Dekker) is the head of the Furnace Creek Mining and Development Syndicate, and it’s clear that he’s up to no good, but it’s not clear what his connection to Gen. Blackwell was. 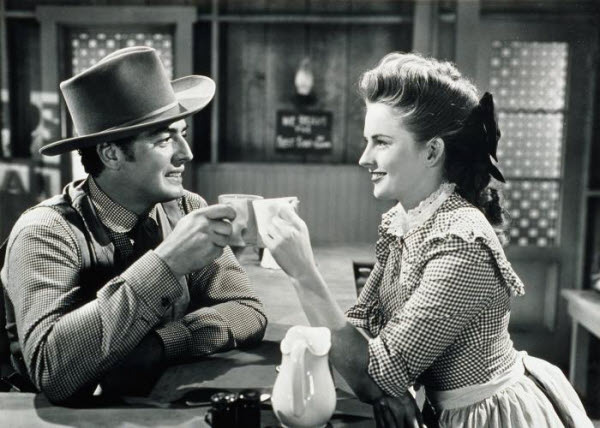 In addition to his detective work, Cash finds time to romance the pretty Molly Baxter (Coleen Gray, who also starred with Mature in Kiss of Death). Molly’s father Bruce died in the massacre at Fort Furnace Creek, and she hates Gen. Blackwell with a passion, potentially complicating things. And before long, Cash’s brother Capt. Rufe Blackwell (Glenn Langan) also shows up in Furnace Creek with his own plan to clear his father’s name. Fury at Furnace Creek has a lot of moving parts, but the plot never feels crowded or confusing. Full of coincidences, sure, but not confusing. It’s genuinely suspenseful, and I wasn’t sure how things were going to resolve themselves. It’s a film that occupies the same basic physical space as John Ford’s Fort Apache (1948), but it takes a completely different approach to the western genre. There’s no self-conscious myth-making or grand statements in Fury at Furnace Creek, it’s just a solid, grown-up western with good production values. The music nicely sets the scene, with strains of the cowboy ballad “Bury Me Not on the Lone Prairie” popping up frequently in the score. The director of Fury at Furnace Creek, Bruce Humberstone (sometimes credited as “H. Bruce Humberstone”), began his career in the silent era and ended up working in just about every genre Hollywood deigned to dip its toe in; musicals, film noir, westerns, war pictures, Charlie Chan mysteries, Tarzan adventures, sports comedies … the list goes on and on. Fury at Furnace Creek is not a great work of art, but it’s made with real flair and craftsmanship. It’s exciting, action-packed, and suspenseful. 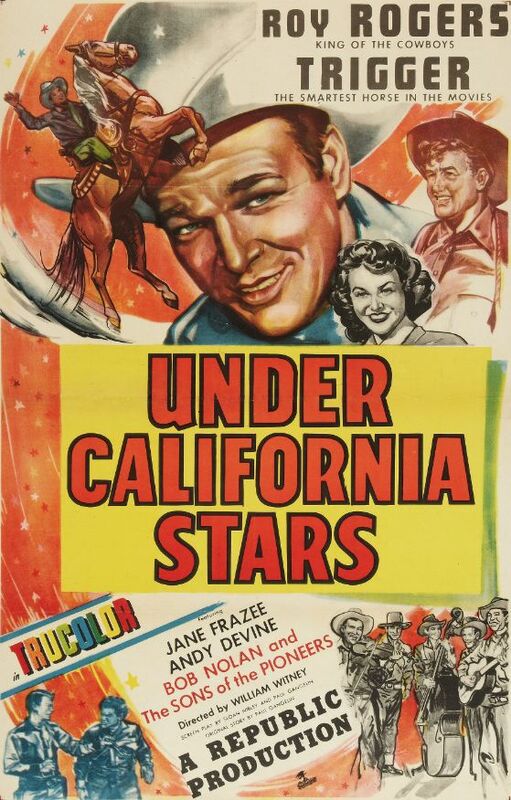 I enjoyed it a hell of a lot and recommend it to anyone who likes westerns from the Golden Era of Hollywood. Posted in 1948, April 1948 and tagged 20th Century-Fox, Albert Dekker, Bruce Humberstone, Coleen Gray, Glenn Langan, Reginald Gardiner, Victor Mature, Westerns. Bookmark the permalink. Edward A. Blatt’s Smart Woman is a film of “lasts.” It was the last screenplay for which Alvah Bessie received a credit. (Louis Morheim and Herbert Margolies are also credited for the screenplay, from a story by Leon Gutterman and Edwin V. Westrate.) Bessie was one of the infamous “Hollywood Ten,” a group of people who refused to cooperate with HUAC and who were blacklisted from the movie industry in 1948. 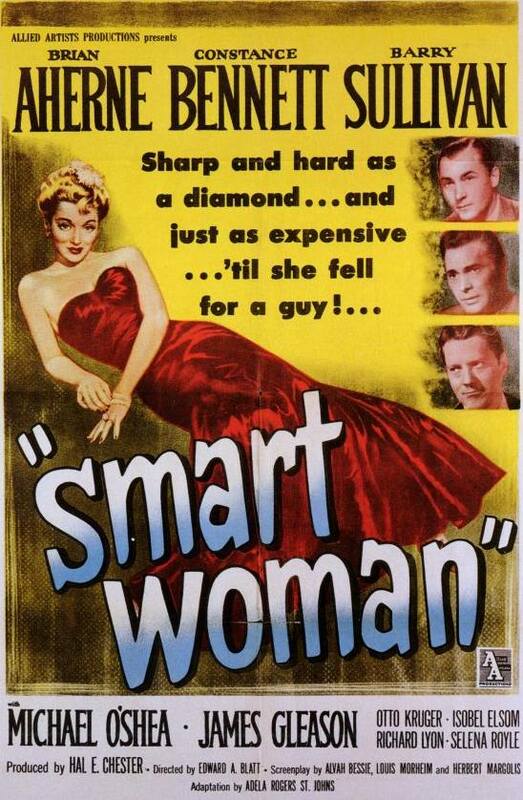 Smart Woman was the second and final film released by Bennett’s own production company, Constance Bennett Productions (the first was Paris Underground in 1945). It was distributed by Allied Artists. Smart Woman is by no means a bad film, but it’s not difficult to see why it didn’t reignite Bennett’s career and launch her back into starring roles. Bennett plays defense attorney Paula Rogers, a woman who’s “smart” not just in the cerebral sense, but also in the sense that she is fashionable and sophisticated. She’s a single woman with a young son named Rusty (Richard Lyon), and her love for her son will force her to make difficult decisions as the plot of the film unfolds. As in most “women’s pictures,” there is a suave, sophisticated, and handsome gentleman to set Paula’s heart (and the hearts of distaff audience members) aflutter with desire. He’s a special prosecutor named Robert Larrimore (Brian Aherne) who’s appointed to investigate cases the crooked district attorney, Bradley Wayne (Otto Kruger), may have improperly handled. There’s also a slippery gangster named Frank McCoy (Barry Sullivan), whom Paula defends in a murder case. The prosecuting attorney? You guessed it … it’s Larrimore. Smart Woman is well-made entertainment, but it’s lacking that essential spark that would move it up into the “must-see” category. Thematically, the film has elements of a film noir or gangster picture, but its cinematic style is straightforward and without any baroque flourishes. The script is well-written, but it contains a lot of parallelisms, which always seem more clever to someone hunched over a typewriter than they play out in an actual film. The film’s leads are good, but they had more active careers in the ’30s than they did in the ’40s, and Smart Woman occasionally feels a little old-fashioned because of it. Posted in 1948, April 1948 and tagged Allied Artists Pictures, Alvah Bessie, Barry Sullivan, Brian Aherne, Constance Bennett, Edward A. Blatt, James Gleason, Michael O'Shea, Otto Kruger, Richard Lyon. Bookmark the permalink. Sixty-four years ago there was a Democrat in the White House facing reelection in the fall, and there was no single heavily favored Republican candidate as the days marched on toward the Republican National Convention. That Democrat was, of course, Harry S. Truman, and he had faced a bitter rebuke two years earlier when the Democratic Party lost 11 seats in the Senate and 54 seats in the House of Representatives in the 1946 midterm elections (a landslide for Republicans similar to the 2010 midterm elections). I’m tempted to keep drawing parallels to the present day, but I’m afraid that if I do it’ll devolve into me spewing a bunch of meaningless facts, like how the 1948 Summer Olympics were held in London, just like the 2012 Summer Olympics. Suffice it to say that this was a good time for me to watch Frank Capra’s State of the Union for the first time. And if you’ve never seen it before, then it’s a good time for you to watch it, too. Adolphe Menjou plays a brilliant Republican party strategist named Jim Conover, who works with the young but equally brilliant Kay Thorndyke (Angela Lansbury) to split the Republican primaries in order to get their own dark-horse candidate the nomination for the presidency. Kay is the ruthless publisher who owns the Thorndyke Press, which was bequeathed her by her equally ruthless father. 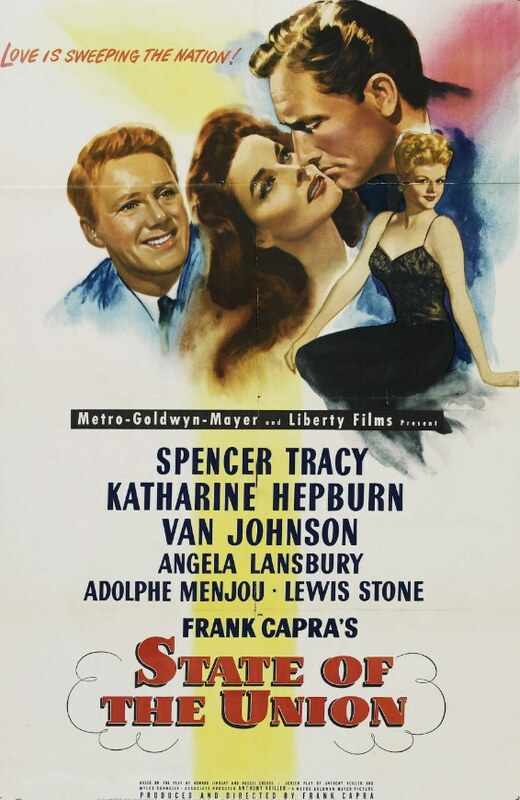 On the other hand, he’s in the midst of a long-standing extramarital affair with Kay Thorndyke, and when he launches his campaign for the presidency, it’s the first time he’s seen his wife Mary (Katharine Hepburn) in four months. I’m not sure why this film isn’t talked about as much as Capra’s earlier films, like It Happened One Night (1934), Mr. Smith Goes to Washington (1939), and It’s a Wonderful Life (1946). Despite its cynical view of our two-party system, I think State of the Union is every bit as hopeful about humanity as Capra’s earlier films. It’s also a very funny film, which I wasn’t expecting. Even when movies about politics are labeled “comedies” I usually find them more depressing than funny, but State of the Union features a cast of characters who are genuinely interesting and likable (and when they’re unlikable, it’s done in a natural and believable way). Capra’s direction is smooth and assured, with shot constructions that are occasionally brilliant, but there are a lot of jump cuts, too, as though Capra cared more about getting the right flow and combination of dialogue takes then setting up his shots seamlessly. State of the Union is based on the Pulitzer Prize-winning play by Howard Lindsay and Russel Crouse that ran on Broadway from 1945 to 1947. The dialogue in the play was changed slightly from week to week to reflect the current political reality, which is obviously not something that can be done once a film is completed and released into theaters. It could be this “trapped in amber” quality that has led to State of the Union being relegated to second-tier status among Capra’s films. If that’s the case, I think that’s sad and short-sighted. Despite the fact that State of the Union is entirely about the 1948 election for president, its depiction of our two-party system, the personal and moral compromises a presidential candidate must make, and the corrupting influence of big money in politics is just as relevant today as it was 64 years ago. 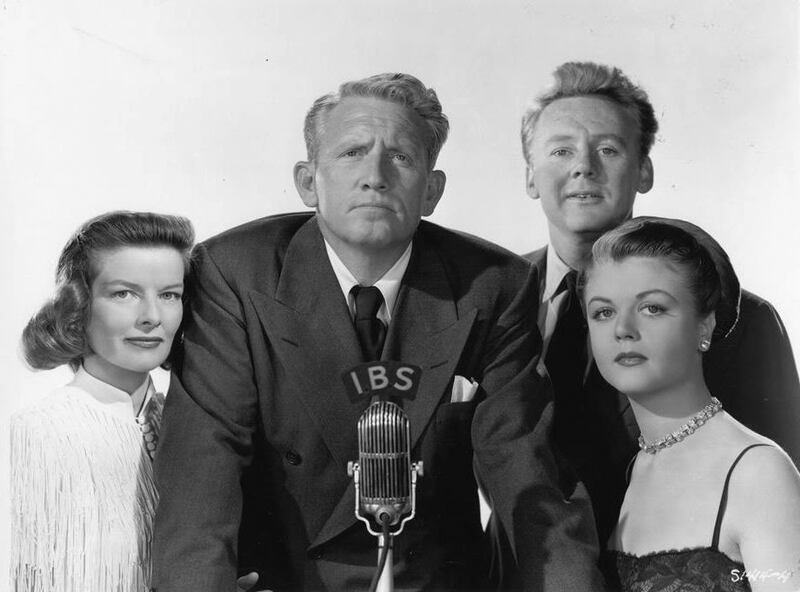 Posted in 1948, April 1948 and tagged Adolphe Menjou, Angela Lansbury, Frank Capra, Katharine Hepburn, Liberty Films, Metro-Goldwyn-Mayer, Spencer Tracy, Van Johnson. Bookmark the permalink. 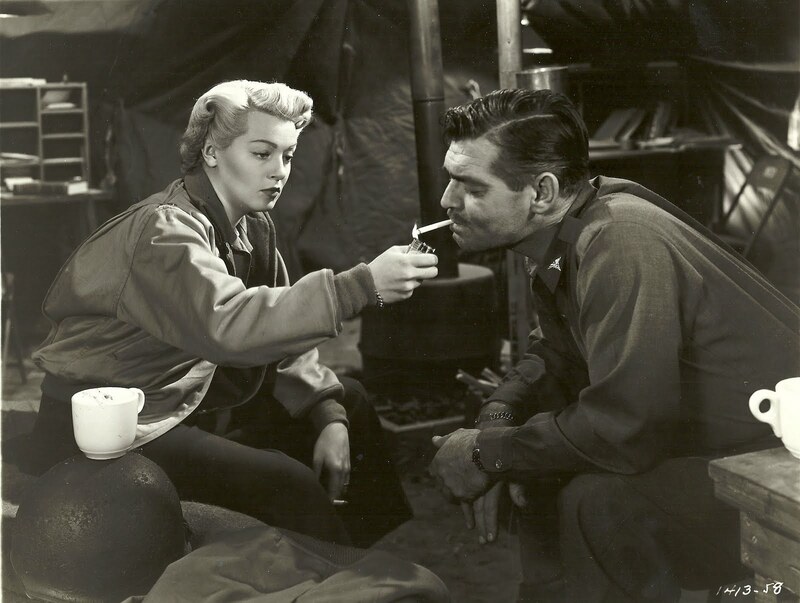 If Mervyn LeRoy’s slick M-G-M romance Homecoming is to be believed, the entire European theater of operations in World War II was an elaborate backdrop for a passionate and illicit romance between Clark Gable and Lana Turner. Dr. Johnson is a noninterventionist who enlists to fight mostly because it’s “the thing to do.” Six year earlier this wasn’t our war, he says, and he doesn’t see how it’s any more our war now. Unsurprisingly, this sharp verbal exchange leads to more sharp verbal exchanges, most of them with a strong undercurrent of flirtatiousness. Dr. Johnson has a wife back home, Penny (Anne Baxter), and McCall has a son to think about, but the more they try to keep things professional, the more the tension builds. It should come as no surprise that Homecoming is more concerned with Dr. Johnson’s budding affair with Snapshot than it is with his moral and patriotic development. For instance, during the battle of Bastogne, the biggest trouble they face is having to abandon their jeep after it’s stuck in the mud. They have no difficulty locating an abandoned farmhouse in which to sexily and achingly hole up for the night. Try watching this movie immediately after watching the harrowing Band of Brothers episode “Bastogne” (Oct. 7, 2001). It will be really difficult to take Homecoming seriously. Actually, Homecoming may be really difficult to take seriously even if you’ve never seen Band of Brothers and are totally unfamiliar with the history of World War II. But if all you’re looking for is a wartime romance starring a couple of members of Hollywood royalty, it fits the bill. 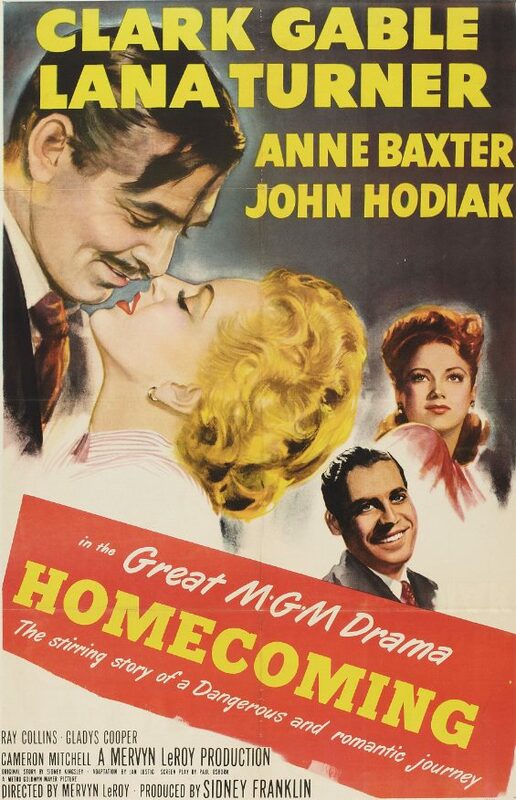 Posted in 1948, April 1948 and tagged Anne Baxter, Clark Gable, John Hodiak, Lana Turner, Mervyn LeRoy, Metro-Goldwyn-Mayer, Romance, World War II. Bookmark the permalink. The key to Max Ophüls’s Letter From an Unknown Woman lies, simply enough, in its title. No matter how rapturous or romantic the proceedings get, the title of the film will nag at viewers’ minds. We know what is coming, even if we’re not fully conscious that we know. Letter From an Unknown Woman takes place mostly in Vienna around the turn of the 20th century. It tells the story of a love affair between a young woman, Lisa Berndle (Joan Fontaine), and a concert pianist, Stefan Brand (Louis Jourdan). When the film begins, Stefan is coming home in a carriage. He appears dissolute and wasted. He is to fight a duel in the morning, and he’s more upset that he’ll have to get up early than he is about possibly being killed. In his apartment, a letter awaits him from Lisa, his old love. In the letter she recalls the stages of her life with him, beginning with girlish obsession, moving on to a more mature love affair, and finally … the end of it all. Through it all we see Stefan, a brilliant and temperamental musician, experience his own journey of love with Lisa, albeit a more selfish one. Letter From an Unknown Woman is based on a story by Stefan Zweig, with a screenplay by Howard Koch. It’s a meditation on love, memory, and loss that I really liked, but didn’t completely love, although I suspect that repeating viewings might reveal added layers. 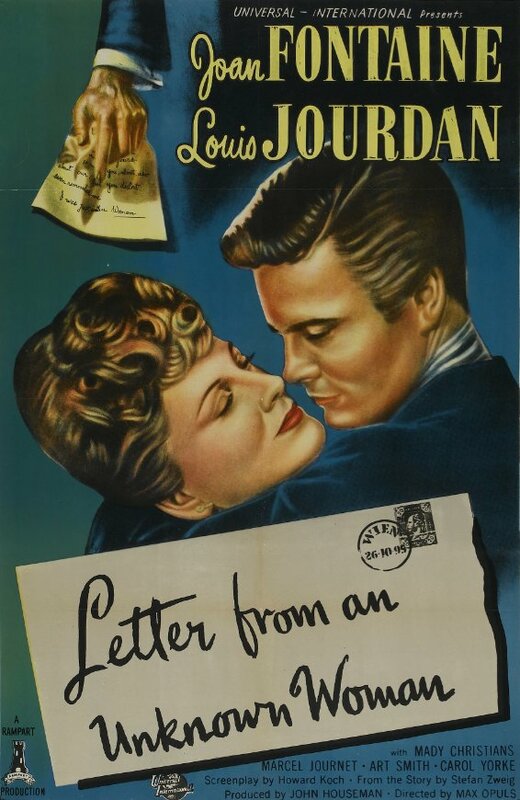 Posted in 1948, April 1948 and tagged Art Smith, Joan Fontaine, Louis Jourdan, Mady Christians, Marcel Journet, Max Ophüls, Rampart Productions, Romance, Stefan Zweig, Universal Pictures. Bookmark the permalink. Julien Duvivier’s Anna Karenina was the second non-silent film adaptation of Leo Tolstoy’s novel. It premiered in the U.K. on January 22, 1948, and in New York City on April 27, 1948. I originally put off watching it because I started reading the novel late last year and wanted to finish it before I saw any film versions. As I mentioned, this was the second adaptation of the novel for sound film, but there were numerous silent versions that preceded both. The first was director Maurice Maître’s 1911 Russian version, which starred M. Sorochtina as Anna Karenina. The second was Vladimir Gardin’s 1914 Russian version, which starred Mariya Germanova. The third was J. Gordon Edwards’s 1915 American version, which starred Betty Nansen. The fourth was Márton Garas’s 1918 Hungarian version, which starred Irén Varsányi. The fifth was Frederic Zelnik’s 1919 German version. Finally, there was Edmund Goulding’s 1927 silent film, entitled simply Love, which starred Greta Garbo as Anna and John Gilbert as her illicit lover, Count Vronsky. 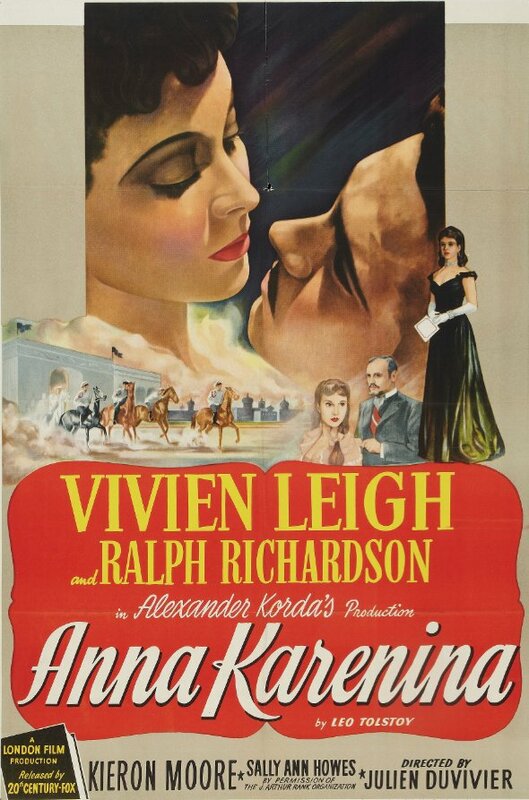 The first sound version, Clarence Brown’s Anna Karenina (1935), again starred Garbo as Anna and Fredric March as Vronsky. I haven’t seen any of the silent versions, but I recently watched the 1935 version. The 1948 version is a less slavishly faithful adaptation of the novel, but I found it a much more satisfying overall film experience. The music, lighting, cinematography, set design, and costumes are all passable in the 1935 version, but they’re really stellar in the 1948 version. Duvivier’s film evokes 19th-century Czarist Russia in a more powerful and magical way than Brown’s film did. The wintry, nighttime scenes in train stations — so important in the novel — are dark, snow-swept, and full of portent. The interiors are richly appointed and realistically lighted. Where Duvivier’s version can’t always compete with the earlier version is in the choice of actors. Fredric March, who played Vronsky in the 1935 version, was for me the most interesting character in the film, while Kieron Moore just doesn’t make as strong an impression in the same role. He’s tall and handsome, but in the end he’s little more than a perfectly coiffed mustache in search of a personality. And Sally Ann Howes, who plays the pretty young Kitty Scherbatsky in the 1948 version, just isn’t as appealing or as good an actress as Maureen O’Sullivan. In the 1935 version, Basil Rathbone gave a terrific performance as Anna’s cuckolded husband, Alexei Karenin, but terrific as it was, it was a one-note performance. Ralph Richardson, however, is just as officious and unlikable in the early going, but he evolves, allowing the viewer to see his pain and anguish despite the fact that Anna is a more natural point of identification. Of course, what no film can convey is the novel’s epic scope or its meticulously crafted evocation of everyday life. Anna Karenina was published in serial fashion over the course of nearly four years, so characters with whom we spend days, weeks, months, and even years in the novel appear in the film for a few minutes here and there, giving the viewer no real sense of their importance in the grand scheme of the narrative. But that’s how it goes in the dirty business of film adaptations of great novels. I liked Clarence Brown’s 1935 version, and I’m glad I saw it, but Julien Duvivier’s 1948 version wove a spell over me. 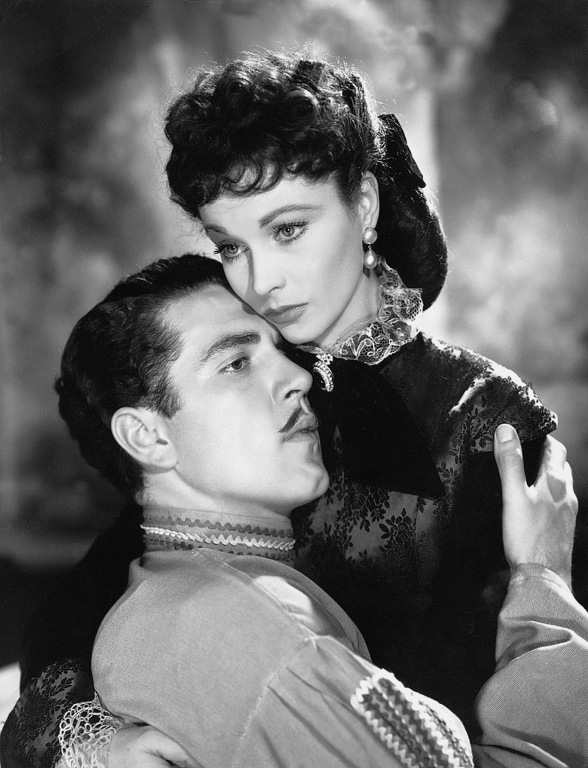 There are certain scenes I can’t stop thinking about, and I loved Vivien Leigh’s performance as Anna. It’s a movie I’m looking forward to seeing again some day. There are many, many film adaptations of Anna Karenina out there competing for your entertainment dollars, and I’ve only seen two of them, but of the two, I much prefer this one. Posted in 1948, April 1948, January 1948 and tagged 20th Century-Fox, Alexander Korda, Julien Duvivier, Kieron Moore, Leo Tolstoy, London Film Productions, Ralph Richardson, Vivien Leigh. Bookmark the permalink.